Saturdays have always meant one thing to me: Pancakes. Now, I don’t have pancakes every weekend, but a Saturday with pancakes just has to turn into a good day. As a kid, my little brothers and I would always wake up with my father already in the kitchen cooking up a huge pancake breakfast. I’ve got so many memories of the family-sized electric griddle plugged into the wall and the familiar smell of the kitchen and dining room turning into our own personal classic diner. We’d all gather around the table, lazy, half-dressed and hungry and Dad would flip some pancakes on to our plates. There were frequent debates on whether syrup is poured before or after slicing up the pancakes, and there were always extra pancakes to go in the freezer for after school snacks the following week. Now, those pancakes weren’t vegan but it didn’t take much work to come up with a convincing conversion. My attempts in the early 90s were usually not nearly as successful as nowadays: I’ve learned more about measurements, mixing, and properly seasoned pans. All crucial to good pancakes. 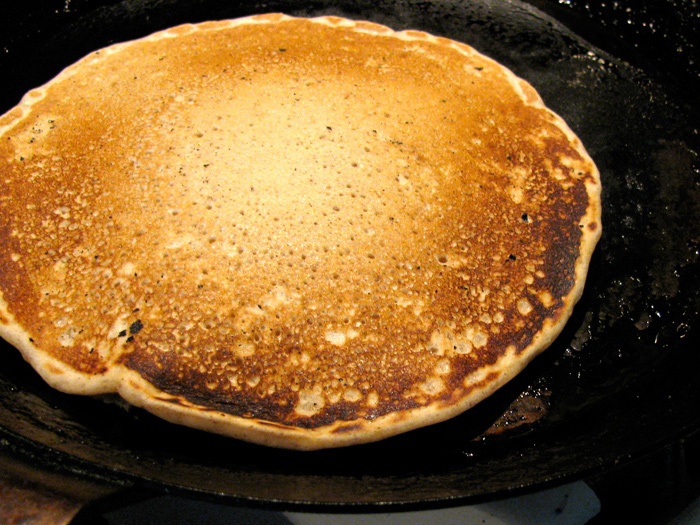 Over-mixed batter makes rubbery cakes and too much oil in the pan results in a fried pancake. 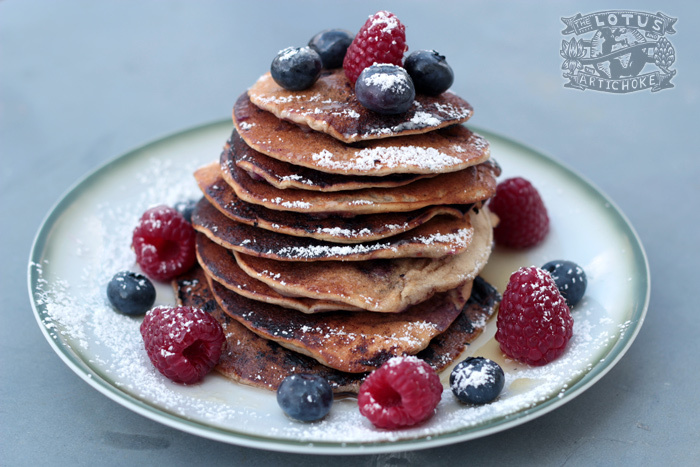 Pancakes take practice, but don’t believe the hype when people tell you good pancakes can’t be made vegan! 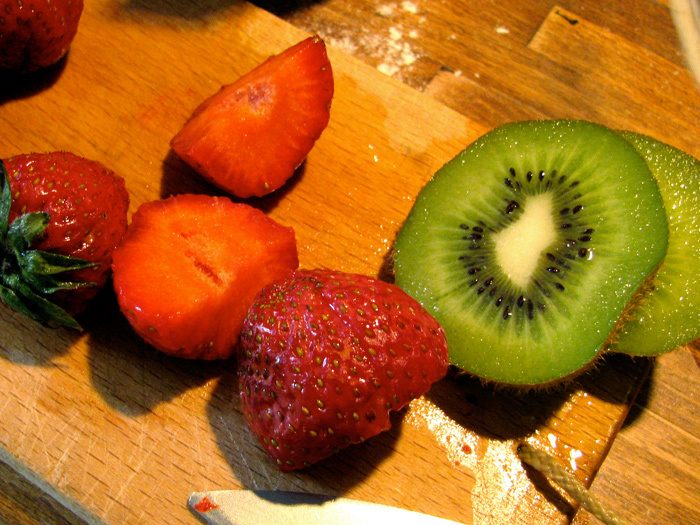 Pile up some fresh fruit and throw on some walnuts. Some decent maple syrup or blackstrap molasses is a great way to go. Note to my dear German friends, please don’t confuse these with traditional Pfannkuchen or Eierkuchen! American pancakes are big, fat and fluffy. We’ll get to your skinny little crêpes later, mon cher. Give it a shot and tell us which figurative side of the Atlantic you’re on this morning. Mix flours, baking powder, sugar, ground flax, salt, cinnamon in a large mixing bowl. Add rice milk and oil. 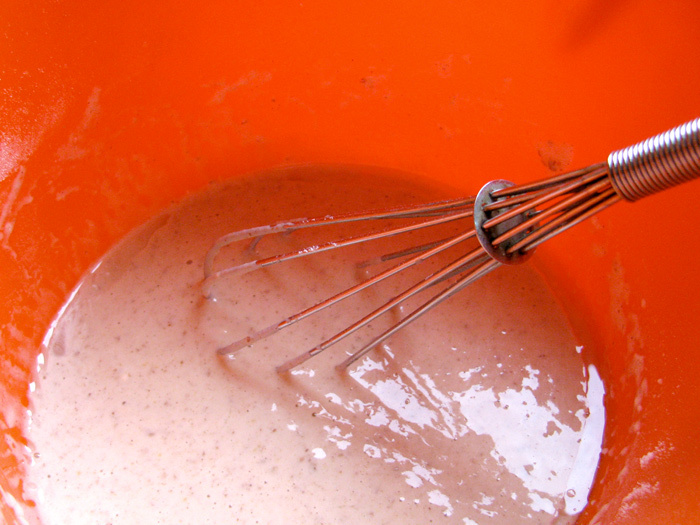 Whisk only until batter is mostly smooth. Small clumps are okay. Do not overmix. Heat a frying pan, preferably a well-seasoned cast iron pan on medium to medium high. Put a few drops of oil on pan and rub it around with a paper towel. Cooking spray can also be used. Do this before each pancake. When a drop of water sizzles and dances on the surface, the pan is ready. Pour 1/4 to 1/3 cup of batter onto pan (Less for smaller pancakes). Pour directly from bowl if it has a spout, or use a cup or ladle. Batter should run out and flatten slowly. If too thick, add more liquid. If too thin, add flour. Stir a few times and try again. When bubbles form on edges and in center of pancake, check underside if ready to flip. Lift an edge with spatula, look for that golden brown color. If this takes longer than 2 min, turn up heat slightly. Flip pancake over. Cook for another 1-2 min. Transfer finished pancake to tray or plate in a warm oven or another pan on low heat and cover. Sparsely oil pan again, do next pancake. Top pancakes with margarine, fruit, nuts, jam, syrup, etc. Enjoy. Add-ins: Add chopped strawberries, raspberries, blueberries, sliced bananas, chocolate or carob chips, walnuts or hazelnuts into the batter just after pouring a pancake. Some prefer to mix extras directly into the batter before pouring; I like the more uniform handiwork at the stove. Earth Crunchy: Add a teaspoon of ground hemp seeds and replace half (or all) of the flour with whole wheat or spelt flour. This entry was posted in American Comfort and tagged breakfast, diner, pancakes, recipe, vegan. Bookmark the permalink. 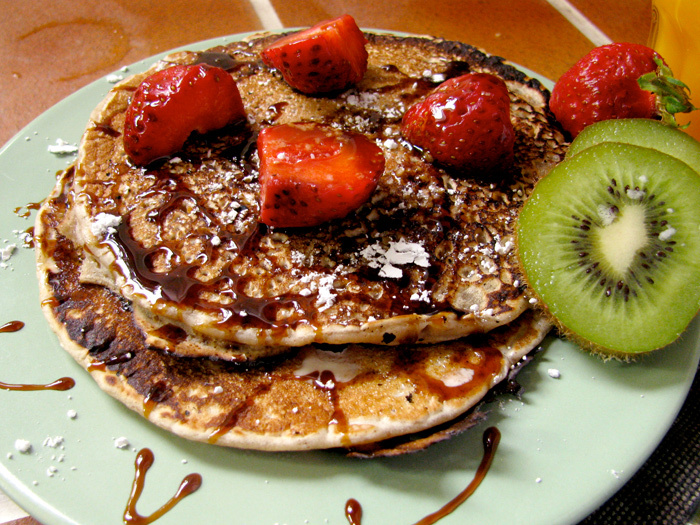 MMM,…Your vegan pancakes look so delicious! Thanks! I appreciate it, Sophie. You’ve got some great photos on your site, too. I like the quiche especially. I make pancakes a couple times a month. Since becoming vegan, I needed to find a new recipe. This one is so good! I used the upper end of cinnamon since I love cinnamon, which gives them an almost French toast flavor. Will definitely be repeating this recipe. Thanks!